It has been nearly a month since my last post. Don´t know where the time has gone, but it was a busy time for me : my Mum was with us, had some challenging work at my daytime job and sorted out the garden before the summer heat arrives. Last Thursday (13th!) we have experienced 2 fairly strong earthquakes. One got me out of bed early in the morning at about 5:30 and the other one when I had my siesta after lunch. As our house is build on a rocky hill, we could really hear and feel the earth moving. Luckily nothing serious happened, only a few pictures in the house were hanging crooked. 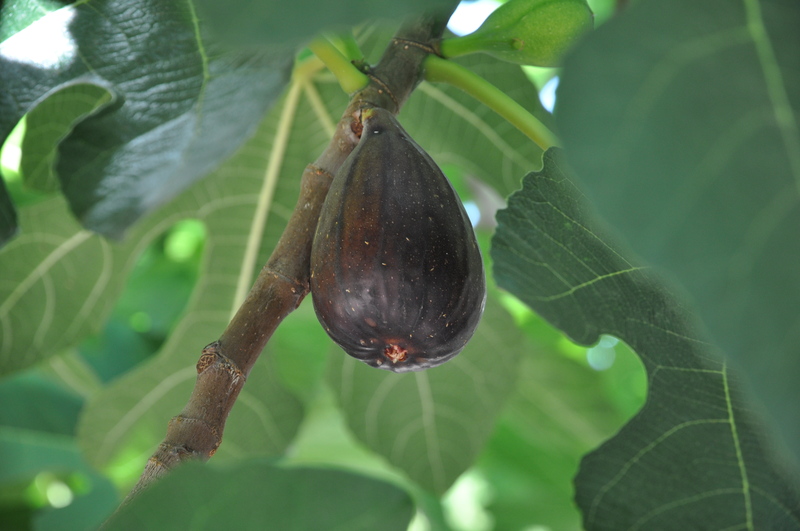 The spring has come to an end : the first crop of figs is ripe on the tree (have to eat them before the birds spot them) and my favorite pot plants are in blossom – Agapanthus africanus alias African Lily or Lily Of The Nile. I just love the wonderful blue flowers. What a pity that they do not flower for a longer time. 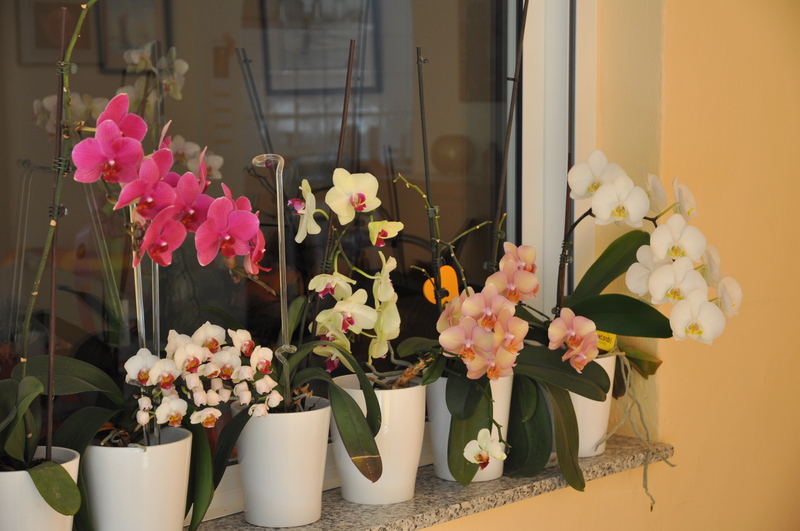 Also all of my orchids on the windowsill are full with flowers. 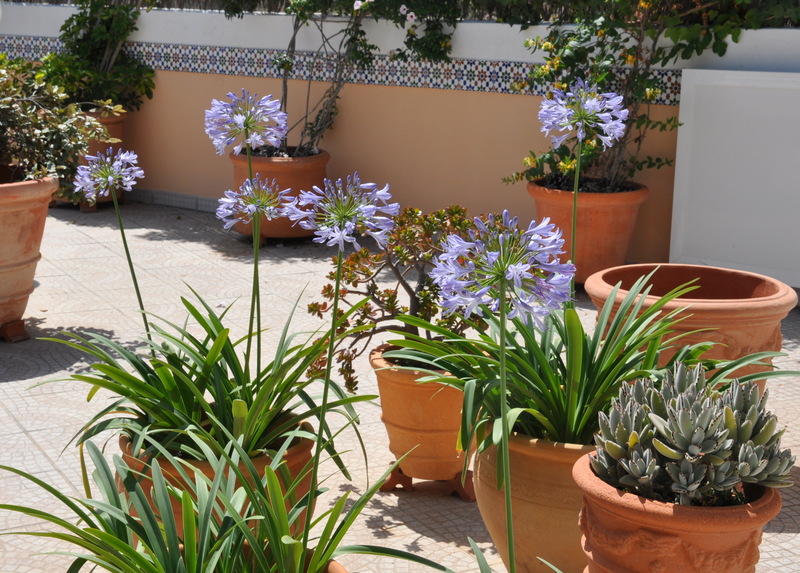 They are so easy-growing plants and give so much joy with their long-lasting flowers in all the different colors. Talking about WIP : I have finally finished the “Squirrel” quilt that I started last year in November. The collection I have used is “The Birds and The Bees” by Tula Pink and some solids I had in my stock. 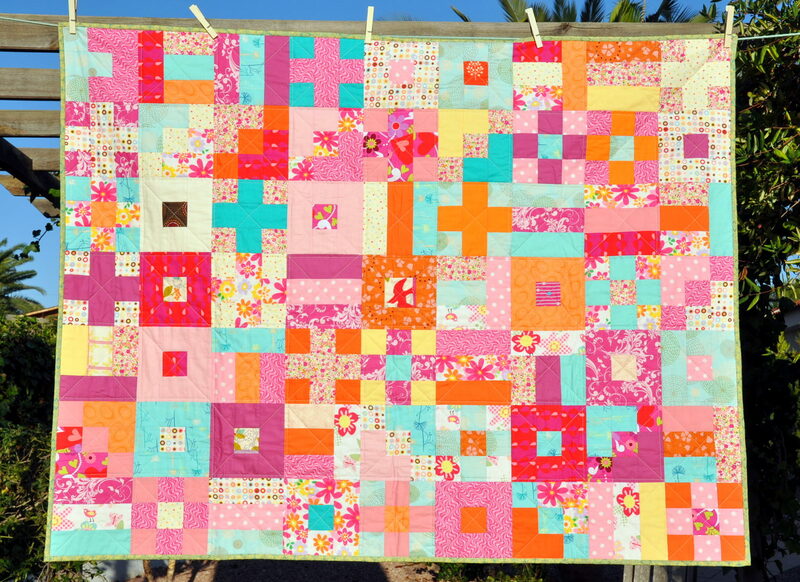 The quilt size is 48″ x 60″, I have pieced nine patch and log cabin blocks together. Quilted straight line with the walking foot in diagonal. 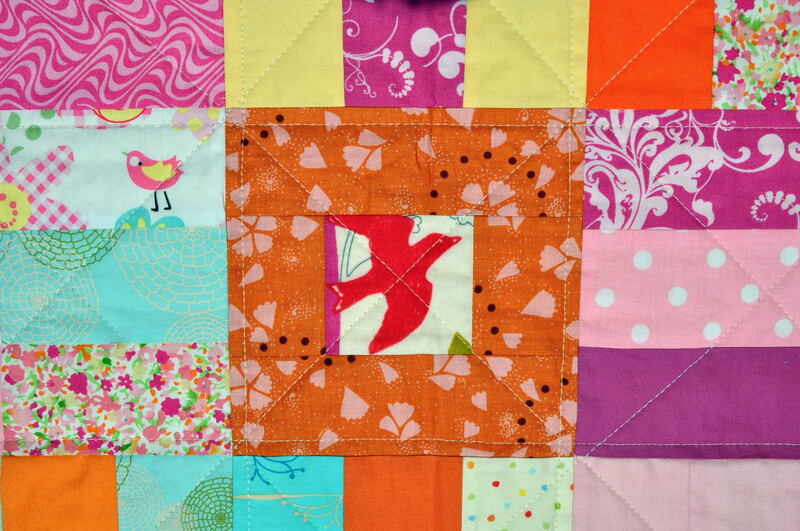 There are 2 panels with squirrels that gave the quilt its name : Meet the Squirrels. 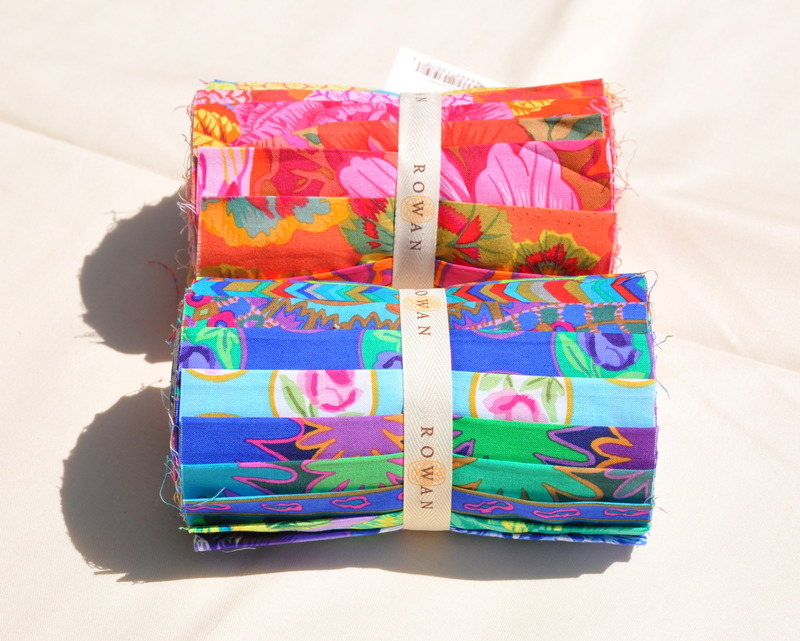 My new project is with Kaffe Fassett fabrics. Somehow I can not resist his fabric designs and colors. Both packages have 20 different fabrics cut into 6″ strips – Happy and Blue; purchased at the Fat Quarter Shop. 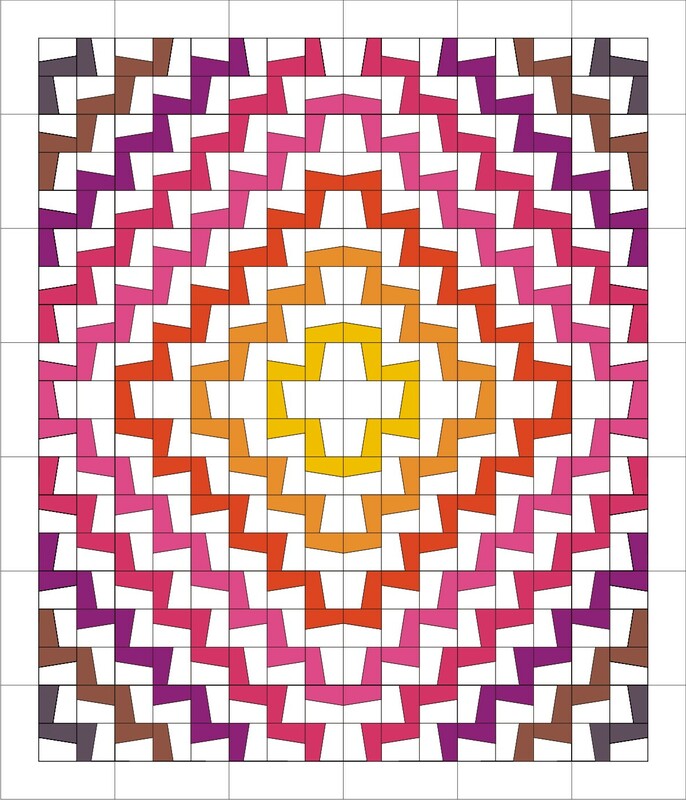 I have a quilt design on my mind, just need to do some calculating and hopefully I can start cutting later today. As it is Monday I am linking up with Lucy over at Charm About You for Plum and June’s Let’s Get Acquainted Link Up! 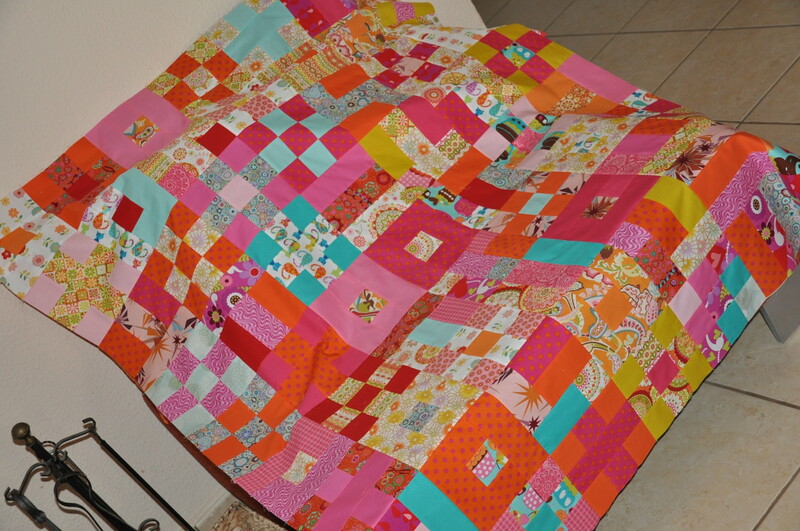 One quilt is finally finished and posted, it is free-motion quilted and the binding is stitched with the machine. I am happy with the result and really like the pink tone of the binding. This reminds me of raspberry ice cream and hot summer. Just to comment : both day and night temperatures in our area have dropped a lot, the icy Siberian winds have reached the Med. No snow, but we have frozen puddles over night. Thinking about what could be my next project I saw some nice nine patch quilts on the internet. This inspired me not only to work with a classical nine patch block, but also with some variations. 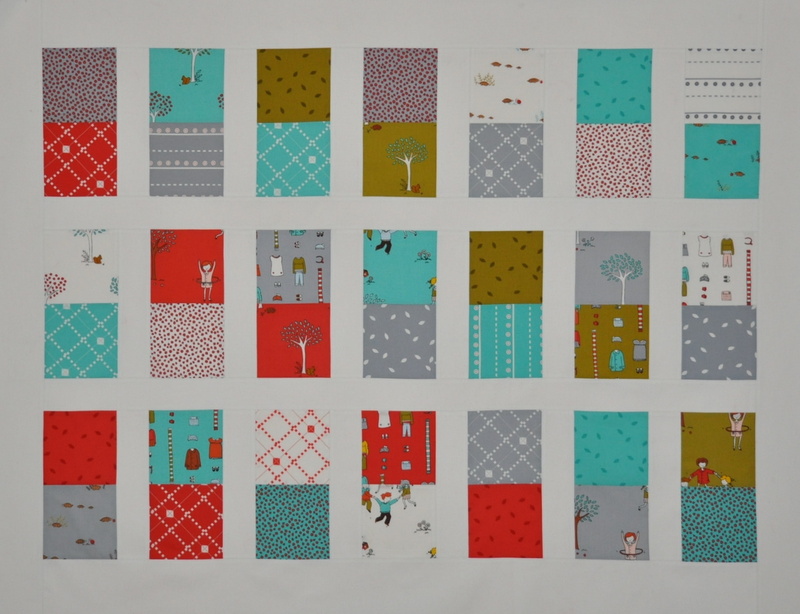 Nine patch blocks are easy to sew, versatile and so a right choice for beginners. 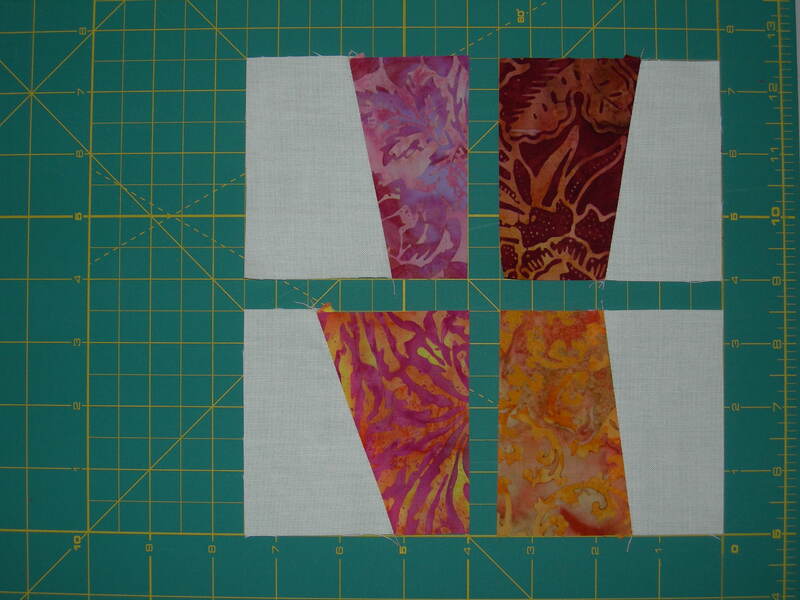 With these blocks you can check (and practice) your exact fabric cutting, sewing skills and pressing. Chain piece using 1/4” seam allowance throughout the project. You can always alternate the size according to your needs : divide the finished block size by three and add 0,5” seam allowance to each cut square. 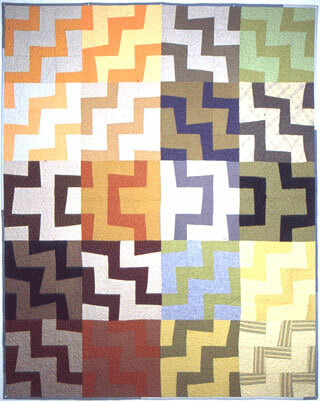 Sit down and think about the finished quilt, which block type you fancy, what are your favorite colours. Make a drawing, use your color pencils and start cutting. I used my favorite colors orange, pink and turquoise. To complete the palette I decided to integrate also some purple hues. Go for your favorite shades, use solids and don’t be afraid to use strong colors. 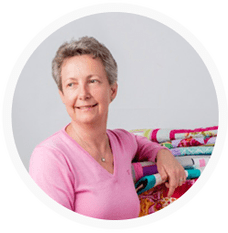 You can opt for a patchwork fabric designer collection (with matched colours) or just use your stash. Chain piece the units row by row together, press seams open. Pin the rows together, check that the seams match and piece, press seams open. Check the block size : 6,5 x 6,5”, trim if needed. 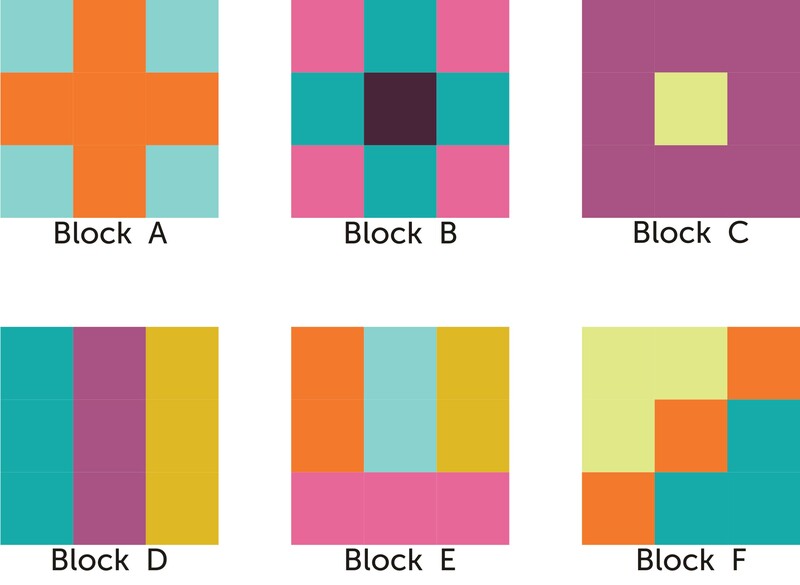 Arrange the blocks randomly row by row. 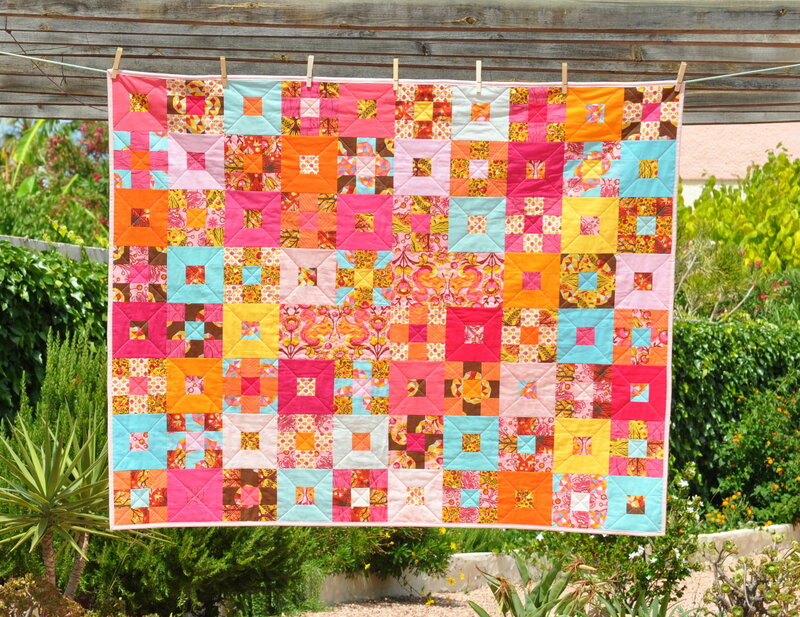 Use your design wall or distribute the blocks on the floor to overlook the quilt design. Rearrange pieces till you are happy with the colour distribution and sew together. 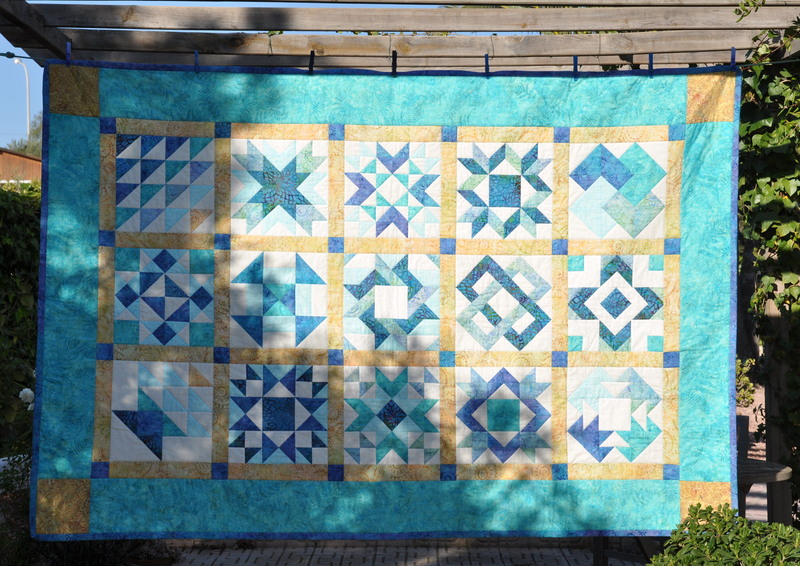 So this is it ………… finished quilt top. 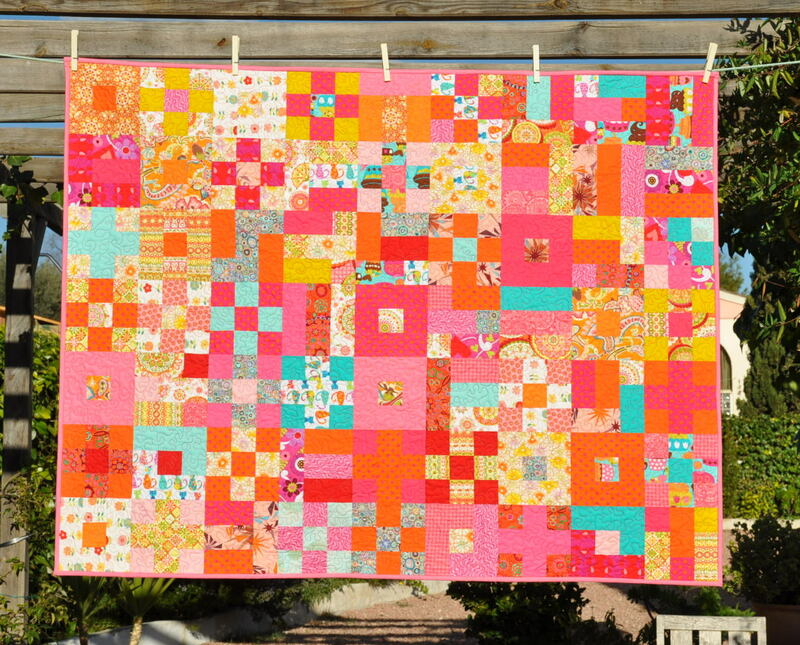 Now prepare the quilt sandwich, give the quilting pattern an other thought and you are nearly there. Cut stripes for binding and your quilt is now finished! !